The lateness of these long-in-coming words concerning last weekend's fine second-coming Philadelphia concert performance by England's Radio Massacre International is partly attributed to my having taken part in the "load-in" into St. Mary's Church and staying all the way through RMI's final jaw-dropping note at 4 a.m. in WXPN's studio. The promoters who do this all the time know; recovery literally takes days. Boy, did I have a lot of fun, though. I have helped Chuck and Gang on a few occasions now and feel as if I'm finally managing to do some things to help move the cause along... instead of getting in the way. For example (and to showoff my gaining expertise), I at one point during the post-concert tear-down felt an impulse to pull Gatherings Series concert-photographer-extraordinaire Bill Forcier aside and show him a 30-ft.-long extension cord that connected one of Jeff Towne's growing assortment of special-effect gadgets (this particular piece being his "fog machine") with an electrical outlet on the side of the church. Why show Forcier the extension cord? For one, this isn't your average cord... it's long; it's twisted; it's one I've had all sorts of troubles unraveling and rewrapping in the past... and it's the same one that I have been accused, by the same Mr. Forcier, of "milking." This time around, I asked Bill to take out his stopwatch. "Ready, William?" Heh-heh. I'm proud to say that his clock had hardly ticked when, in a blink of an eye, I had that thing wrapped, bound and sealed in its big Rubbermaid container, the latter of which upon my right foot rested in a most casual state of professionalism. Forcier, needless to say, was impressed. Speaking of impressed, I'd find it hard to believe that anyone leaving St. Mary's last Saturday was "not so" in regard to the performance of Radio Massacre International. Before Steve Dinsdale, Duncan Goddard and Gary Houghton took the stage, we Gatherers were treated to a concert-series unveiling of the sound of St. Mary's pipe organ. I can't count the times in Gatherings past that I've looked at those pipes and longed to hear their sound. This would be the night. 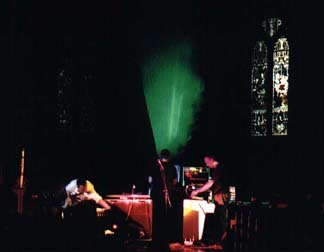 After many minutes of the subdued sounds of the organ, RMI walked onto the stage, sans introduction, and the sound filling the cathedral slowly, almost imperceptibly, shifted from the somber sounds of the organ to the meditations of Dinsdale and Goddard resonating from two mellotrons. Each mellotron was graciously donated for the evening's performance. The mood of the initial set remained dark throughout, nebulous, forlorn; quite uncharacteristic to what I've heard from RMI in the past (yet it is hard to know exactly what to expect from this talented band). 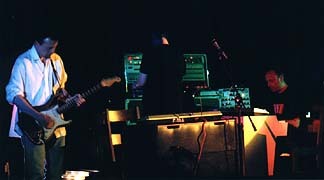 Guitarist Houghton, who sat during the first set, used his just-purchased lap steel guitar to add to the obscure somberness. Dinsdale, it should be noted, showed up in another brand-new $4.99 locally flavored T-shirt (PHILLY was splashed across its front). One can't help but look at Steve Dinsdale and smile. He faced the audience all night, spoke for the band, and seemed to spend a lot of time looking at a most spectacular stained-glass window at the rear of the church, maybe using it as a focal point in which to filter the wonderful happenings throughout. Aah, how the tone of the evening... and Mr. Dinsdale's wardrobe, too!... certainly changed during RMI's high-potency sequence-charged second set. Dinsdale came out in a different T-shirt, this one literally flashed to the beat, though I'm not sure how or where it was plugged in. He would transform into a creature of sophisticated animation. Houghton stood and ravaged us with some wonderfully mean guitar riffs. 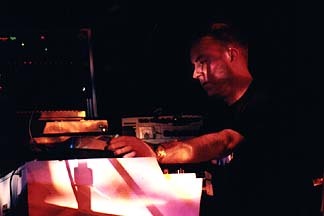 Goddard retreated often to the synth located rear-stage and created squelches and distorted sounds that even Saul Stokes would have been proud of. 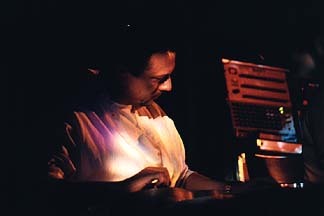 It was during this set when Jeff Towne's latest special-effect gadget was revealed. Funny, to look at the thing in Jeff's hand ahead of time you'd think, "Humpf! Sure don't look like all that much to me." But in combination with a fog machine (and its expertly unwound extension cord) this thing worked wonders. The produced effects were mesmerizing, as Towne manipulated a green laser beam into smokey vortexes and high-speed rotations that transported us, in combination with RMI's above-mentioned high-energy sequences, to that special place. I'd probably have to use my toes and fingers twice now to tally up the amount of times I've witnessed a Gatherings Series event. Maybe, or maybe not... I dunno... I'm qualified to say that the fine persons putting this event together are getting better and better. I was at a local event here in my hometown last evening, a non-electronic-music concert, and heard two strangers speaking to one another about a neat concert series each had recently discovered in Philadelphia. It was ours. The hard work and dedication is paying off. You can sense it; see it. A 3:50 a.m. yawn of mine stuck. RMI was wrapping up its second consecutive hour of its WXPN radio concert, and its evening, too, for that. My nose was pressed against the studio 's window. I probably looked bit Miss Piggy-ish, if any of the boys had bothered to look out from the other side. Exhaled steam, forming on the window, was starting to obstruct my view, but I wasn't moving, and my jaw wasn't retracting either. Was anybody else up at the crazy hour listening to the magic taking place? On an already phenomenal night, Radio Massacre International had saved its best for last. The beauty of this finale was that the band, which had set the musical patterns in motion, was able to sit back and enjoy the final moments with us. Yeah, take it easy, guys. They had a long ride home. Saturday May 15th saw the end of the Spring Concert series of The Gatherings in Philadelphia, PA. 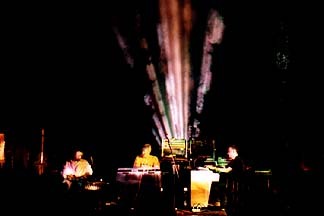 The trio of musicians known as Radio Massacre International (Steve Dinsdale, Gary Houghton and Duncan Goddard) made the return trip back to the States, after having performed here only about 18 months ago. I had missed the last time they were here and wasn't going to waste this second opportunity. As we were admitted and took our seats, an older gentleman was playing the church organ and I thought it a little unusual as introductory music for RMI. However, this was done on purpose as the band appeared without being announced and segued into Steve (who was sporting a yellow shirt with "Philly" embroidered across the front) and Duncan playing on the two Mellotrons that had been loaned to the band for the show. 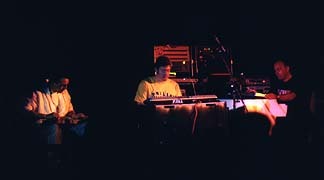 Gary joined in first on a lap steel guitar and then later on an electric guitar. There did not seem to be any structure to this first set, but there were perhaps three or four distinct segments - ranging from drifting space music to a jazz-like jam - played with no breaks. Even though this music was being played live right in front of us, it had an older vintage sound (not a bad thing) with the roughness that RMI is known for. After a brief interval (where Steve changed wardrobe into a black shirt that had its own lights), Chuck van Zyl then introduced the band and we were treated to a long 'stonking' sequencer piece - a highly energetic and motivational number. Boggles the mind to think that this was perhaps a fortunate accident, the band not really knowing where inspiration will take them while performing. It is so hard to put into words what could only be heard and felt especially now, many days later, but our shared appreciation of this driving, penetrating music and the impressive smoke and laser-light show was noted by Steve who simply commented into the microphone, "Liked that one, eh?" It would be a shame if this never appears on a future release from the band and fades from memory. They continued the second set and performed another sequencer piece that also deserves to be shared with those who could not make it out this night. After another short break, RMI came out for an encore that started out humorously: with Gary playing some short country number on the guitar, before they turned their attention to more serious business: closing what turned out to be an interesting and entertaining evening. Well done. 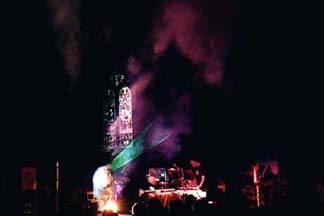 After all the mentions and reviews of RMI's performance at The Gatherings, I felt compelled to comment on the "other" live show they did they did that evening, and that was the late night 2 hour set they did for Star's End. Let me preface this short review by saying that I had the incredible opportunity to witness in person this amazing event, and I'd like to thank Chuck van Zyl, Art Cohen, Jeff Towne, and Steve, Duncan and Gary of RMI for allowing me to participate in what can only be best described as a truly magical and once in a lifetime experience. After walking the short distance from St. Mary's with the band, we lugged and heaved what seemed to me mounds and mounds of equipment up 3 flights of stairs to the WXPN studio, (I'm sure it wasn't all that bad, but at midnight my age certainly made it seem so). After everything finally got upstairs, the band had to painstakingly reconnect all of the equipment that they just disconnected only a matter of hours ago. 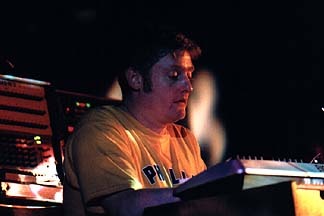 Duncan took to setting up his synths and sequencers first, followed by Steve and Gary after Duncan and Jeff spent a bit of time tracking down a nasty hum coming from somewhere between the many layers of Duncan's gear and the ancient WXPN studio's electrical wiring. While the band was setting up, I was assigned along with soma611, the task of roaming the streets of West Philly in a quest to find a late night pizzeria to fetch the band some late night dinner. At 2 AM RMI went live. The lights were dimmed. As one would expect of a Star's End set at 2 AM, the band's performance was initially subdued and atmospheric. Each creating their own quiet sonic passages. At times it seemed like they were totally immersed in their own performance, unaware of anyone else playing in the room, but that's when you notice the genius of their playing. Watching an improv performance is like nothing I've ever witnessed. Each member was alone in his own little space but always aware of his sonic surroundings and the path the music was creating. Playing on the radio gave the band the luxury of being able to talk to each other while performing though I must say, there wasn't as much dialogue as you'd expect. For 90 minutes the band's playing was subdued and beautiful, with colorful sonic passages alternately drifting back and forth between Steve and Duncan's multi-layered synths and Gary's exquisite guitar playing. But then something happened at around the 90 minute mark. Little by little the band started to come alive with a frenetic energy that seemed to be building in strength over the last 90 minutes and was just now struggling to be let out. As one mind, the band mates all seemed to sense this and the band came alive. Multi layered sequencer rhythms started issuing forth, building upon each other, getting louder and faster. For the next 30 minutes the music rose to a dynamic intensity. With the music charging forth with such a feverish energy, it was interesting to ponder how the band would conclude this. At approximately 3:55, the band yelled over the music that they'd be stopping in 5 minutes at 4 AM. I'm not sure who decided this at that particular moment, they originally figured on playing to 5, but it was Steve Dinsdale who was yelling over the music the countdown. With the music playing probably some of the wildest and fastest sequencer rhythms I've ever heard live, Steve literally yelled out the count down..5..4..3..2..1.. STOP! And suddenly, it was quiet. Chuck van Zyl's familiar voice came on the airwaves and the show was over. The band members stood up and looked over and just smiled. They knew they had just done something magical. An improv performance that was one for the books. Personally I enjoyed that performance better that the one I had seen at The Gatherings earlier that night. Maybe it was because I was in the room with them while they were performing it, possibly, maybe it was just the late night studio atmosphere with an audience of I think 5 people, or maybe it was because it was 4 AM and I was totally tired. Probably a combination of all 3. Either way, it was an experience I'll remember for a long time.